Israel truly is the startup nation. There are more startups in Israel than in Western Europe, and the number of Israeli patents is among the largest for any country in the world. Shares of numerous Israeli companies trade on the NASDAQ stock exchange while acquisitions of Israeli high-tech companies by foreign investors inject many billions of dollars into the country every year. A colorful legend holds that when God offered the Torah to the Israelites at Mt. Sinai, they were reluctant to accept it. God then lifted the mountain over their heads in a threatening manner, mak-ing them an offer they could not refuse. They reconsidered. The saga of economic liberalism, some-times dubbed "neoliberal-ism," and Israeli economic growth bears some similarities to that legend. Modern Israel has developed into something of an economic miracle, largely as a result of economic liberalization, driven by entrepreneurship, innovation, investment, and the accumulation of human capital. Yet Israelis have never been entirely comfortable with economic liberalism and indeed are by and large hostile to it. Like their wandering ancestors, they have benefitted in spite of their disinclinations. Israelis may be the most entrepreneurial population on the planet; their capabilities in innovation being, for example, the essential message of Start-Up Nation, the New York Times business bestseller. There are supposed to be more startups in Israel than in Western Europe, not per capita, but in absolute numbers. 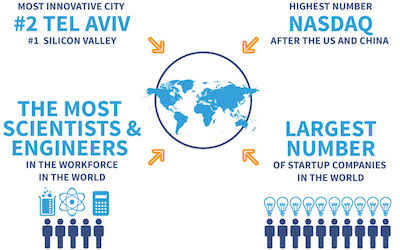 With a population of eight million people, Israel has over 6,000 startups. In the 2015 Bloomberg Innovation Index, Israel was ranked ahead of the United States, France, and the United Kingdom. The number of Israeli patents is among the largest for any country in the world while shares of numerous Israeli companies trade on the American NASDAQ stock exchange as well as other exchanges. Acquisitions of Israeli high-tech companies by foreign investors inject many billions of dollars into the country every year. Among the reasons for the country's success are its well-educated labor force, a high household savings rate, high levels of imported capital, a strong immigration rate (which includes many highly-educated people), and especially—in recent years—an extremely creative high-tech sector, which so far operates largely outside the realm of government regulation. This economic good news is all the more remarkable in light of the fact that Israel began its existence in the late 1940s as an impoverished third-world country, whose economy might have been discussed in the same breath as that of India or Egypt. Today, Israel has a gross domestic product per capita comparable to that of the middle-income countries of Western Europe, roughly the same as Italy's. Israel was one of the only countries in the world whose economy did not contract during the global financial crisis that began in 2007. Its rates of inflation and unemployment have been better than those of the United States and Western Europe in recent years. The economy has shown its resilience in the face of numerous challenges and shocks, including chronic terrorism, frequent military conflict, a huge defense burden, a dearth of physical natural resources, and the need to integrate people arriving from scores of different countries and cultures. Ironically, this dramatic transition from low-development status to today's very high level took place largely despite economic policies that were, in many cases, designed to prevent growth and efficiency. Economic policy has been liberalized slowly over time, but this occurred by and large in the face of governmental reluctance. In some cases, especially regarding the reduction of import protectionism, this was forced upon the government as part of multinational trade agreements. Israeli economic policy has almost always stifled competition; protected inefficient sectors; allocated resources based on political negotiation, lobbying, and political power; and suppressed market forces in large swaths of the economy. This "reign of pork"— has included the maintenance of an enormous bloated public sector, a long series of bailouts for failed enterprises, high tax rates, and a gargantuan budget. Israeli economic success is disconnected from the every-day economic philosophy of most of the Israeli public. Israelis from all parts of the political spectrum are devoted to maintaining a near-Scandinavian level of welfare state benefits. Income and wealth disparities are obsessions for a broad swath of the citizenry, and all parties promise to redress them, often by means of taxes that will "soak the rich." Most Israelis use the terms "capitalist," "privatization" and "deregulation" as pejoratives while "socialist," or at times even "communist," is something of a romantic compliment (though one that has also come to imply a certain naiveté.) Both middle- and upper-income Israelis are highly likely to vote for political parties of the Left, like the Israeli Labor Party or Meretz, which openly denounce economic liberalism and romanticize the egalitarianism of socialism. Working-class and low-income Israelis are much more likely to vote for the parties of the Right and religious parties although these parties are often really parties of the Left when it comes to economic liberalism. Communism still holds a romantic appeal for many Israelis. 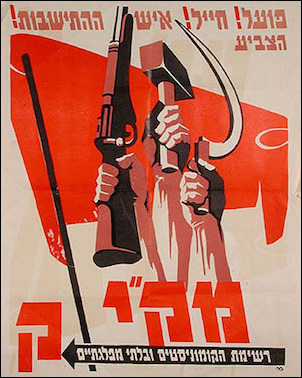 This poster from an Israeli communist party of the 1950s reads, "Worker! Soldier! Settler! —Vote for Us." Many Israelis use the term "capitalist" as a pejorative while "communist" remains something of a compliment. All political parties promise to redress wealth disparities, often by means of taxes that will "soak the rich." Modern Israel has essentially always had two electoral parties with respect to economic doctrine and policy, but they are neither Labor or Likud, nor even their forbearers, the socialism-light of David Ben-Gurion's Mapai or the quasi-capitalist Revisionists of Ze'ev Jabotinsky. Rather, one is a party that believes in maximizing governmental controls over the economy, suppressing competition, cozying up to industrialists who show party loyalty, restricting imports through protectionism, and maintaining as many monopolies and cartels as possible. The other political party advocates for freer markets, economic liberalization, free trade, competition, de-politicization of the economy, and reduced government controls. But the reality is that the party that believes in maximizing governmental control is whichever of the two large political parties happens to be in power. The free-market party is whichever of the two main parties happens to be in the opposition. Thus to understand truly the state of economic liberalism in Israel, it is necessary, first of all, to separate rhetoric from policy. The second most important thing is to understand the depth of the cognitive dissonance that characterizes the bulk of Israelis, especially the political elite, with respect to economic liberalism. The same Israelis who pine for Scandinavian socialism are masters of innovation and entrepreneurship. Anti-liberal economic positions characterize nearly all party platforms on the right-leftpolitical spectrum. Even those opposing the private medical care in hospitals don't wish to prevent private medicine, and most likely, prevention would have been against our founding principles, mainly the right to try and achieve the best for one's health. In a similar fashion, the Israeli minimum wage was raised shortly before the 2015 elections. Every single party in the Knesset supported the increase with the only opposition coming from those who thought it was not raised enough. A bizarre debate then took place between the mainly Arab Communist Party (HADASH) and representatives of Habayit Hayehudi Party (The Jewish Home, usually considered a far-right party), over which of the two should be recognized as the more enthusiastic and effective party in promoting the increase. While all parties are superficially opposed to monopolies and cartels and supportive of competition, they are all equally reluctant to implement effective antitrust policies. In the last elections, the Labor Party (calling itself the "Zionist Camp" for this vote) ran on a platform explicitly opposing removal of the crop and production control mechanisms that maintain food prices higher than they should be. With the exception of a new party run by ex-Likud politician Moshe Kahlon (who ran on a platform calling for antitrust initiatives in the Israeli banking sector), the parties generally avoided spelling out which monopolies and cartels they wanted to see disbanded. Similarly, none of the parties ran on a platform opposed to import protectionism, especially for agricultural products. While Habayit Hayehudi leaders did speak about the need for increased competition to bring down food prices, its head, Naftali Bennett, had been minister of commerce in the previous government where he did virtually nothing to liberalize restrictions on food imports. A Tamar field oil rig. 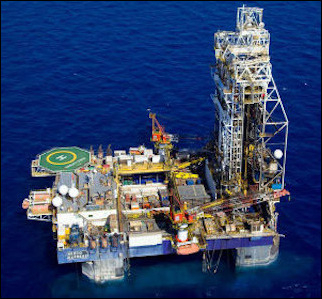 One of the most important economic developments in Israel's history has taken place in the last few years with the discovery of the substantial Tamar and Leviathan fields of natural gas off the Mediterranean coast. But instead of celebrating the windfall, Israelis have characteristically turned the bonanza into a tug-of-war between socialist aspirations and so-called "gas tycoons." The main domestic issue in the 2015 elections was housing inflation. Every single party spoke out about how troublesome that inflation was while none offered any concrete plan for reining it in. The only party to propose anything specific was the Yesh Atid party of Yair Lapid, who served as minister of finance in the previous Netanyahu government. His proposal to control housing inflation was a mixture of rent and price controls plus an exemption from levying value added taxes (VAT) on new-home buyers. This would have, in fact, increased demand for housing without changing the supply curve. Allowing people to buy housing without paying VAT would result in their bidding higher prices for the existing housing stock. Stagnant supply combined with elevated demand can produce only one thing. None of the parties ran on a platform to privatize state-owned lands, state-financed universities, or most other public holdings. None ran on a platform of expansion of school choice or use of vouchers. No party ran on a platform of seriously reducing the dimensions of the Israeli welfare state. Under the pre-2015 Likud government, one of the most important economic developments in the country's history took place involving the huge reserves of natural gas found off Israel's shores. The ensuing policy debate clearly demonstrated the continuing ambivalence of much of the country toward economic growth. Israel has conducted oil and gas exploration ever since its independence. But for many years, it appeared that such efforts were an exercise in futility, mainly an excuse to maintain employment of the large staffs at the government-sponsored exploration companies. Starting in 2010, two substantial natural gas fields with large reserves, Tamar and Leviathan, were discovered by the private sector off the Mediterranean coast as well as additional fields showing promise for future production. The fields are large enough to turn Israel into a moderate-sized energy exporter and re-present a major windfall for the entire country. The Israeli government came under public pressure to capturea larger portion of gas profits for the public purse. Instead of forming the basis for some sort of national festival of energy independence, the discoveries triggered two major policy debates for the government. The first had to do with production royalties from the gas fields. To motivate exploration in the past, the government had always signed generous contracts promising considerable royalties to any company actually striking gas, probably never expecting much success. However, once the magnitude of the recent finds became evident, the government came under public pressure to revise the agreements in order to capture a larger portion of the profits for the public purse—at the expense of the private-sector exploration companies. "Gas tycoons" became targets for populist ire. We're caught in this very embarrassing situation where we sold a lease for exploration with certain conditions, and due to the huge discoveries which were beyond our imagination, we decided "Oh, we made a mistake," and we are changing the rules of the game after the game was over. No sooner had the royalties issue been resolved than a different policy issue cropped up. Initially, it had been expected that the bulk of the natural gas bounty would be exported for hard currency. But the gas bonanza had wakened a populist sentiment to keep more of the gas inside the country supposedly for Israelis' benefit. Why internal consumption of the gas was more to Israel's benefit than export earnings was never made clear. Fears of the "loss" of resources due to exporting can be found in other countries, not just Israel. In the United States, there is popular opposition to allowing "foreigners" to use U.S. energy resources or technologies or to own U.S. real estate. Populists in Israel have been similarly demanding that the discovered natural gas be kept in reserve just for local use. Why selling some gas on the world market benefits Israelis any less than selling Jaffa oranges or computer chips to other countries is something the opponents of exporting cannot explain. A larger portion of the gas was then pledged for domestic use, regardless of export market considerations and returns on investments. Restricting the ability to export the gas freely means it brings in a lower level of revenue. It is a populist move designed to award domestic consumers with unearned and undeserved profits at the expense of national revenues. 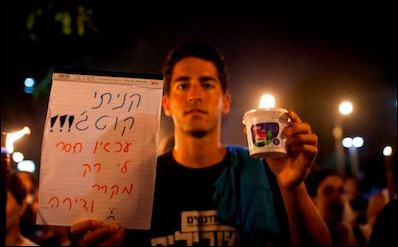 A young Israeli holds a food container with a sign reading: "I bought my cottage cheese, now all I need is a fridge and an apartment." Housing price inflation was the main domestic issue in the last general election as well as the one before it, but ironically, housing price inflation is a side effect of Israel's economic success. Israelis as a society have become economically wealthy, which in turn helps increase price pressures on the real estate market. But that just opened a different can of worms. Since the portion of the gas to be piped into Israel for domestic use would be sold by two private sector corporations, concerns suddenly arose about the exploitation of the local market by a "duopoly," and Israel's antitrust official became involved. Prime Minister Netanyahu wants the whole arrangement to be exempted from the country's antitrust laws. The Netanyahu gas resolution was struck down by the Israeli Supreme Court—but over a constitutional issue. The deal stipulated that the Knesset would be barred from changing the regulatory regime covering the gas arrangement for ten years. The court ruled that the current Knesset cannot limit what future parliaments might do. At the time of writing, the government is trying to find a resolution. its own fields if what is charged by the two domestic marketers is found to be above world market prices. It seems likely that the subtext to the debate was an expectation that the gas be sold domestically at well below world prices even though this would be economically inefficient. A simple solution might be to regulate the domestic sales price of the natural gas marketed inside of Israel and then allow the "duopoly" to operate overseas as unregulated entrepreneurs. The Knesset approved an arrangement for marketing the gas inside Israel in September 2015 by a thin majority, but opposition parties continue to protest and lobby against it. At the time of writing, the matter is still unresolved and facing litigation. Housing price inflation was the main domestic issue in the last general election as well as the one before it. Ironically, housing price inflation is a side effect of Israel's economic success. Housing prices reflect economic wealth, and many Israelis have become wealthy. An important avenue for making the most of their growing wealth is by upgrading their housing. While not all Israelis are wealthy, enough are so as to jack up housing prices. Indeed, housing inflation as an indicator of economic success helps explain why it is such a difficult matter to resolve. Housing prices can be brought down fairly easily by making Israelis less wealthy, but that is hardly likely to be a popular policy prescription. Most government holdings of undeveloped land are in distant locations, far from the country's urban centers. Clearly there are both supply- and demand-side considerations that affect housing inflation. Most of the price pressure, however, comes from the demand side. Another important factor is the Bank of Israel's policy in recent years of keeping interest rates very close to zero, a macroeconomic monetary policy designed to keep up general economic growth. In practical terms, such low rates mean that ordinary Israelis can borrow large amounts of capital to bid on housing, which then drives prices upward. The Bank of Israel has taken some small steps to reduce these pressures by imposing regulations on the down payments required to obtain mortgages (currently at about 30 percent of the purchase price). But after years of quantitative expansion of the money supply, there are plenty of Israelis flush with cash who have no problem making that down payment. There are also factors on the supply side that aggravate price inflation, and there is room for reform in these matters. Much of the undeveloped land in Israel is still held by the government, and release of that land for development purposes would bring down land prices, which tend to be at least two-thirds of the cost of finished housing. This might relieve some of the cost pressures, but most remaining government holdings of undeveloped land are in distant locations, far from the country's urban centers. The government has also tinkered with modifying building regulations to allow for the construction of taller buildings and more intensive and dense development, but such changes are unlikely to be large enough in scale to have a major impact on prices. Furthermore, many construction materials are still subject to monopoly and cartel control; breaking these producer groups up could lower construction costs somewhat. But all these supply-side measures together are unlikely to fix the housing inflation problem. Yet most of the solutions offered by the ministers of finance in the current and previous governments are manipulations that could actually worsen housing price inflation. Recently, the ministry of finance has proposed offering government land to contractors at less than full market value, hoping that the contractors would then pass on the savings to the consumer in the form of housing units priced below market. Such a delusion cannot withstand a freshman course in economics: Such underpricing in the tender will merely be pocketed by the contractors. If forced somehow to pass it on to home buyers, the windfall will just be pocketed by the buyers. Housing stock will not be any less scarce or expensive. As noted above, then-minister of finance Lapid proposed exempting new home buyers from the value added tax on new housing units. Never implemented, the measure would simply have increased housing demand without changing supply. After the 2015 elections, the new minister, Moshe Kahlon of the newly-established Kulanu (All of Us) party, proposed increasing taxes on "investments in housing" (as opposed to on housing consumers), presumably to drive "speculators" out of the market. But how can the government distinguish between a housing consumer and a housing investor or speculator? Besides, many housing investors are also landlords. Driving them out of the market will only cause rental housing costs to skyrocket more than they have already as demand will once again outstrip supply. As such, the proposal would simply siphon off some of the excess housing demand into the rental market, pricing all but the richest yuppies out of Greater Tel Aviv altogether. When Likud took office for the first time in Israel's history in 1977, expectations were that it would carry out far-reaching economic liberalization and a dismemberment of the state control system. In fact, very little changed although an urban legend was born: It claimed that the Menachem Begin government disbanded Israeli socialism and thrust the country into the clutches of capitalism under the guidance of Milton Friedman. An urban legend claimed that the Menachem Begin government disbanded Israeli socialism. In reality, Begin had little interest in and even less understanding of economic policy in general and economic liberalization specifically. The only real liberalization that was introduced in 1978 was a relatively minor change in the exchange rate regime, moving to a smoother system of devaluations and eliminating some of the bureaucratic obstacles for people who wanted to purchase and hold foreign currency. Yitzhak Shamir, who succeeded Begin in 1983, had even less patience for and interest in economic policy. Under him, many of the liberalization measures regarding foreign currency were reversed. Licenses for purchasing foreign currency were restored for a while, and a bizarre travel tax was imposed on any Israeli leaving the country for any purpose. Serious structural change, particularly in the capital markets, remained elusive until 1985, prevented as part of the collaboration between the two large parties, which the previous year formed a national unity government. Starting in 1985, the financial markets were liberalized; bank savings were released from government control, and government-provided credit largely disappeared from the market. The movers in that process were Yitzhak Modai, finance minister from the Liberal Party within the Likud, Labor prime minister Shimon Peres, and Bank of Israel governor Michael Bruno. Under later governments—both Likud and Labor—some limited liberalization has indeed been introduced. Import protectionism has been eliminated in large part though there are still complete prohibitions on the import of many products and in many markets (such as most fruits and vegetables). Other previously highly-protected markets, such as textiles and electronics, have lost their tariff and non-tariff protections. In the government of Ariel Sharon, then-finance minister Benjamin Netanyahu pushed for and implemented decreases in tax rates, perhaps his main reform. He also raised the retirement age. To his credit, Netanyahu has begun initiatives to rein in the sabotage of the seaports by union leaders, some of whom have been implicated in wide-scale criminal activities and racketeering. There has also been talk of opening "private" seaports to compete with the unionized official ports, but such undertakings have yet to materialize. One of Netanyahu's main achievements (though the Bank of Israel really deserves the credit) is price stability, namely a very low rate of inflation, lower than in the United States and most of Europe. Unemployment has also remained low by international standards although, once again, this is less thanks to policy prescriptions and more of a result of labor market flexibility and efficiency. When people can move freely from profession to profession and from location to location, unemployment tends to fall. Economic liberalization has so far remained largely rhetorical under Habayit Hayehudi, the Likud's current coalition partner, whose platform also contained pro-market reform slogans. But its leader Naftali Bennett, who served as minister of economics (previously "commerce") in the 2013-15 Netanyahu government, and as such was in a favorable position to eliminate many anti-productive policies and institutions, did little to effect such change. 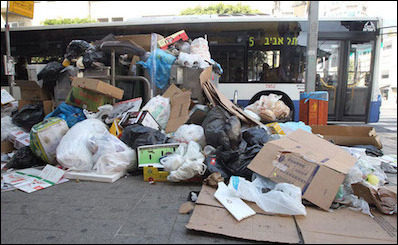 Trash piles up during a strike by Tel Aviv sanitation workers. Crippling strikes still occasionally occur in Israel, including a general strike called by the Histadrut every year or so lasting for a few days. The Histadrut also shuts down the airports occasionally. The situation has improved somewhat due to the massive growth in high-tech firms, which are almost never unionized. While there has been some progress in implementing liberal economic policy in Israel, there is still much work to be done. Protectionism should have been pushed back even further in recent years as the excess in foreign currency reserves has become a serious headache for the Bank of Israel, which should have implemented further import liberalization. Israeli agricultural cartels continue to struggle to drive food prices ever higher. The uncompetitive banking sector also remains a cartel today. Organized labor still roils the economic waters. In its early decades, the country had a notorious reputation for industrial unrest with countless strikes and industrial actions led by unions and with the support of the national Histadrut trade union federation. This situation has improved somewhat over the years though not as a consequence of government policy; in part, it is due to the massive growth in high-tech firms, which are almost never unionized. Crippling strikes still occasionally occur in Israel, including a general strike called by the Histadrut every year or so lasting for a few days. The Histadrut also shuts down the airports every once in a while. Nothing has been done to rein in the electric company union, another syndicalist powerhouse of extortion. Wages in the Israel Electric Company remain among the country's most inflated, due to union pressures. Both Likud and Labor have pursued privatization of government-owned enterprisesin a half-hearted manner. The uncomfortable truth is that throughout much of the Israeli political spectrum, economic liberalism remains a term of disparagement. The Israeli media and much of the political establishment continue to speak out against "piggish capitalism," by which they mean capitalism in general and economic liberalism. Interestingly, probably the most outspoken media voice in Israel in favor of economic liberalism is The Marker, the business supplement of the daily Haaretz, which is without question the most leftist mainstream newspaper in Israel in its editorial positions on non-economic issues. This may largely be due to free marketer Nehemia Strassler running the business pages and supplements in the paper. One often sees the temptation by the current Likud government to revert to the government control policies of yesteryear. Some of these impulses come from its coalition partners but nevertheless have been implemented under Likud governments. A recent example is a bizarre law designed to control—and inflate—book prices. Proposals for price and rent controls in the housing market are also becoming more common. Anti-trust policy continues to be meek and confused. Attacks against business pyramid structures and con-centration are popular though largely rhetorical at this time. Fiscal constraint seems to be falling by the wayside, and money supply has grown rapidly in recent years. More money in circulation is the result of the absence of fiscal restraint and is the cause of future inflation. Both Likud and Labor governments have pursued privatization of government-owned enterprises in a half-hearted and zigzag manner. There is actually some evidence to indicate that Likud was less aggressive about privatization than Labor in recent decades. Netanyahu, who has dominated Israeli politics in one form or another for the last two decades, has sometimes been described as a neo-conservative for his foreign and defense views, especially by left-leaning commentators. These commentators also presume he is following neoconservative economic policies yet most would have difficulties identifying which Likud economic policies are such. In the 1990s, before Likud's return to power under Netanyahu, a panel on economic policy was set up by opposition Knesset members. This author was invited to speak to the group. At one point, frustrated by the inability to get my points regarding economic liberalization across to the group, I commented sarcastically that perhaps Likud members should simply stop claiming to be free marketers and just declare themselves the other socialist party. Netanyahu was present and chuckled, "No, we are not a socialist party, we are a Peronist party." Peronism is widely regarded as a form of corporate socialism or "right-wing socialism." Whether Israel will become serious about economic liberalization is still in question. Steven Plaut teaches in the Graduate School of Management at the University of Haifa. Michael Shalev, "Have globalization and liberalization 'normalized' Israel's political economy?" Israel Affairs, Spring-Summer 1998, pp. 121-55; idem, "Zionism and Liberalization: Change and Continuity in Israel's Political Economy," Humboldt Journal of Social Relations, 1998 (1-2), pp. 219-59. The Times of Israel (Jerusalem), Feb. 2, 2015. Dan Senor and Saul Singer, Start-up Nation: The Story of Israel's Economic Miracle (New York: Twelve, 2009). Dennis Mitzner, "5 Reasons behind Israel's Startup Success," TNW News (Amsterdam), July 7, 2015; Globes (Rishon Le-Zion), Feb. 10, 2014; The Jerusalem Post, Feb. 15, 2015. The Bloomberg Innovation Index, 2015. YNet News (Tel Aviv), Nov. 24, 2009; The Times of Israel (Jerusalem), Feb. 15, 2015. Avi Ben-Basset, ed., The Israeli Economy 1985-1998: From Government Intervention to Market Economics (Cambridge: MIT Press, 2002), pp. 1-58, 423-44; Michael W. Klein, "Studying Texts: A Gemara of the Israeli Economy," Israel Economic Review, May 2005, pp. 121–47. Ben-Basaṭ, The Israeli Economy, pp. 281-308. Steven E. Plaut, "Pork in Israel," National Review, Summer 1992, pp. 73-80. Yakir Plessner, The Political Economy of Israel: From Ideology to Stagnation (Albany: State University of New York Press, 1993), pp. 79-114. Michael Shalev, "The Welfare State Consensus in Israel: Placing Class Politics in Context," in S. Mau and B. Veghte, eds., The Welfare State, Legitimacy and Social Justice (Aldershot, U.K.: Ashgate, 2007), pp. 193-209. Mati Wagner, "The Start-up Nation's Socialist Blip," The Jerusalem Post, June 6, 2012. Haaretz (Tel Aviv), Mar. 19, 2015. Nissim Cohen, "Public Policy, Alternative Politics, and Institutions: A Conceptual Framework and the Case of Health Policy in Israel," Ph.D. dissertation, Ben-Gurion University of the Negev, Beersheba, 2010; Barbara Swirski, Hatim Kanaaneh, and Amy Avgar, "Health Care in Israel," The Israel Equality Monitor, Nov. 1998. Shlomit Avni, Dani Filc, and Nadav Davidovitch, "The Israeli Medical Association's discourse on health inequity," Social Science and Medicine, Nov. 2015, p. 123. The Jerusalem Post, Jan. 21, 2015. Natan Sachs and Tim Boersma, "The energy island: Israel deals with its natural gas discoveries," Brookings Foreign Policy Papers, Feb. 2015. The Times of Israel, Aug. 6, 2015. The Jerusalem Post, Jan. 29, 2015. The Jerusalem Post, Mar. 27, 2016. Globes, Feb. 19, 2015; The Times of Israel, Nov. 29, 2015. Israel Hayom (Tel Aviv), Sept. 28, 2014; The Times of Israel, Sept. 28, 2014. The Jerusalem Post, May 2, 2015. The Marker-Haaretz, Oct. 29, 2007; Haaretz, May 27, 2013. Stanley Fischer, "The Israeli Stabilization Program, 1985-86," American Economic Review , Papers and Proceedings of the Ninety-Ninth Annual Meeting of the American Economic Association, May 1987, pp. 275-8. Yair Aharoni, "The Changing Political Economy of Israel," Annals of the American Academy of Political and Social Science, Jan. 1998, pp. 127-46. Forbes (New York), Nov. 13, 2015. The Marker-Haaretz, Nov. 11, 2003; Haaretz, Dec. 1, 2003; Globes, May 4, 2012. The Jerusalem Post, Aug. 13, 2007; Haaretz, Oct. 20, 2008. Emma Murphy, "Structural Inhibitions to Economic Liberalization in Israel," Middle East Journal, Winter 1994, pp. 67-9. M. Harris, Y. Katz, G. Doron, and A. Woodlief, "Ideology and privatization policy in Israel," Environment and Planning: Government and Policy, 1997 (3): 363-72. Guy Ben Porat, "Netanyahu's Second Coming: A Neoconservative Policy Paradigm?" Israel Studies, Fall 2005, pp. 225-45; idem and Fany Yuval, "Israeli Neo-conservatism: Rise and Fall?" Israel Studies Forum , Summer 2007, pp. 3-25. Related Topics: Israel & Zionism | Steven Plaut | Summer 2016 MEQ receive the latest by email: subscribe to the free mef mailing list This text may be reposted or forwarded so long as it is presented as an integral whole with complete and accurate information provided about its author, date, place of publication, and original URL.